In honor of St. Patrick's Day....We've already covered a Rainbow colored fruit dish, and today is all about veggies! Ever since I made the switch years ago to eating healthier, I've made a commitment to myself to try and include some form of vegetable with almost every meal and snack. It's hard, and being creative is key, but I truly love (raw) veggies and the sweetness that they do have! The only vegetable I'm turned off by is eggplant. It's just not right. The more you eat them, the more you will crave them. I promise. It's like chocolate. The more you eat it, the more you want it. And eventually you've bought a 5 pound bag of dark chocolate from Costco. The same goes for veggies. Seriously, I promise. The idea of this pizza came from a meal I had at one of my favorite healthy restaurants in Las Vegas (I'll share soon!). It was a flat bread greek pizza, drizzled with this sauce and OMG I wanted to cry! I've been making varieties of flat bread pizzas at home ever since, and this one is a quick and easy one any one would love! The base for the pizza is hummus, which obviously is my favorite condiment/food group. (Hummus is a food group, didn't you know?) I love using hummus because it has a bean base (Bonus! ), lots of flavor, and gives pizza that extra oomph needed when you aren't adding cheese on top! Then I topped it with my choice of sauteed vegetables that I cooked for a few minutes in coconut oil and salt & pepper. While the pizza was cooking, I made a 'Ranch' dressing sauce to go on top. Since the pizza is cheese less, I knew this added bonus would give the pizza exactly what it needed to come together. 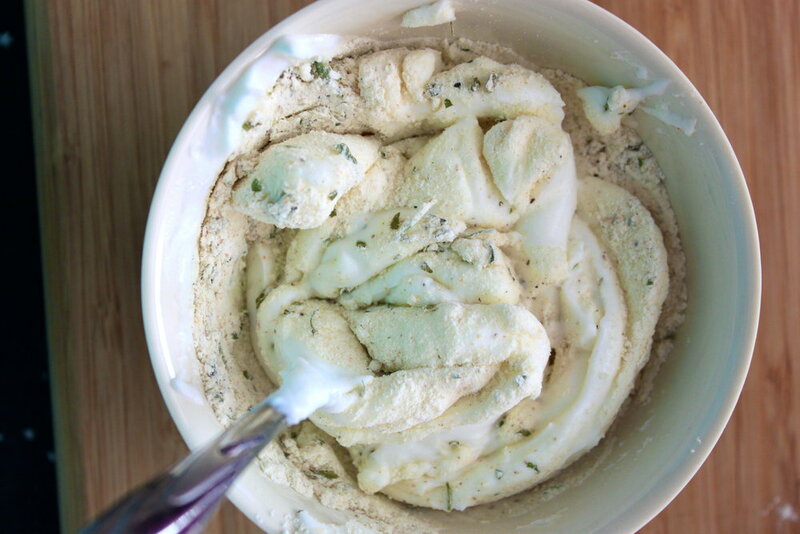 Greek Yogurt + Organic Ranch Dressing Mix=Heaven. It's added protein with that ranch dressing flavor, and it goes perfectly with veggies! I promise, eating vegetables will be pretty exciting after this! You can change up the veggies, sauce, spread, etc. with this flat bread pizza! It's all up to your taste buds and what you have on hand! Have fun and enjoy tasting the rainbow of veggies! 1 flat bread, tortilla, naan bread, etc. Add coconut oil to medium/low heated pan. Add veggies and toss in oil. Sprinkle in salt & pepper. Cook for about 5-7 minutes on medium heat, until veggies and cooked down a little. 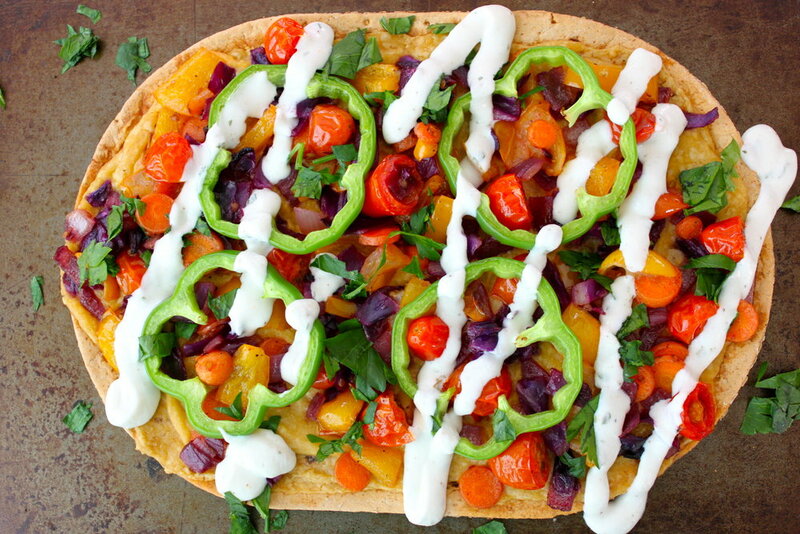 Put your flatbread on a baking sheet. 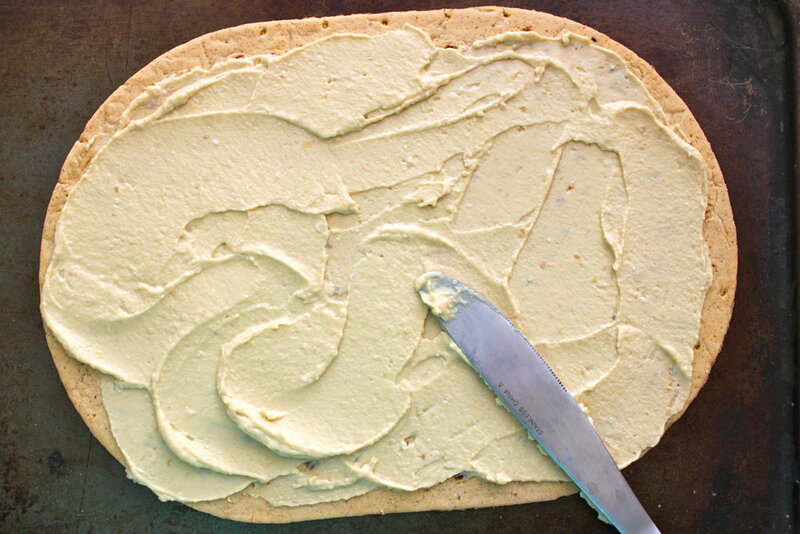 Spread hummus onto flat bread. Add cooked veggies and place pizza in the oven. Cook for 10-15 minutes, or until pizza edges are crisp. Thin out with a 1-2 TB. of non dairy milk. Add greek yogurt to a plastic bad and cut a corner edge off. Drizzle greek yogurt sauce onto cooked pizza. Sprinkle with fresh parsley. Happy St. Patricks Day! Don't forget to taste the rainbow in a healthy way!! I just love my little cutie!